Stellaris: Apocalypse DLC Review – Is That a Moon…Or…? I’ve been playing 4X space strategy games for as long as I remember. Master of Orion 2 stands out to most people as the absolute pinnacle of the genre, even today. 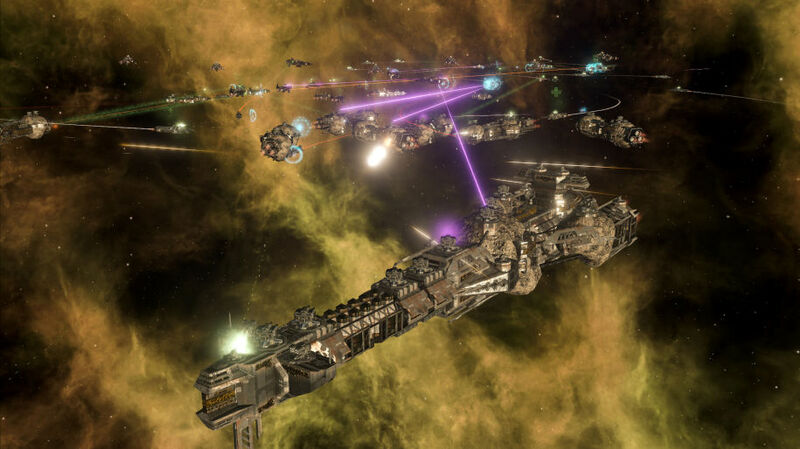 Fortunately (or unfortunately, depending on how you look at things), there has been a steady stream of space strategy games that have inundated the gaming market like a meteor shower in recent years. I’ve tried all of them, but in the back of my mind I knew that 4X games in general are such a time sink, that I had to narrow all of the available titles down to just one. Both Stellaris and Endless Space 2 gradually emerged as the two front runners. That is until Stellaris’ Utopia DLC dropped (along with its Megastructures, Habitats, Ascension Perks, etc.) back in April 2017. 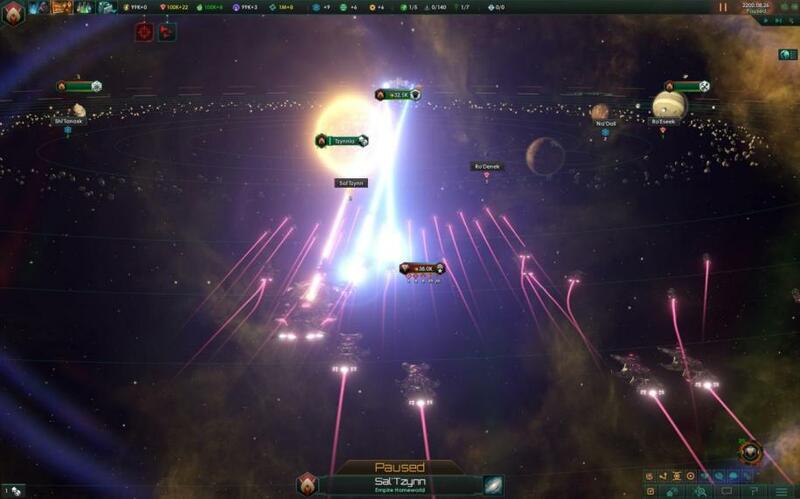 That was when I knew that Stellaris was rising to the occasion and shaping up to be the phenomenal space strategy game that everyone knew it had the potential to be. Aptly named Apocalypse, this latest DLC seems to be aimed at delivering mostly mid-to-late game content. There is a new pirate faction to contend with (or work with) called Marauders. No, these aren’t the cute little pirates who trickle out from their little asteroid bases every once in a while to act as occasional annoyances. These are full-fledged galactic Mongols who will announce their displeasure (via diplomacy screen) with you as soon as you encounter them. Marauders are an interesting inclusion because just like any Fallen Empire that happens to be in the game, they have the potential to “awaken” at some point during a game. What that means is that they’ll become unified under a great Khan and begin rampaging across the galaxy. However, if you do enough to curry their favor you’ll be able to enlist them as mercenaries and have them attack your enemies. I used this as a great tactic against really strong opponents in order to soften them up, before swinging in with my uber-fleet and administering the killing blow. 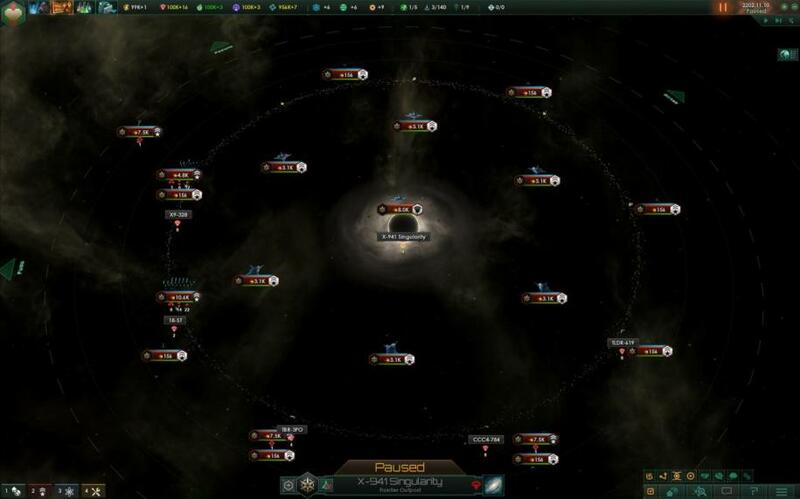 Apocalypse comes alongside Stellaris’ new 2.0 upgrade, which I personally love. Not only is the new UI fresh and tidy looking, but everybody is now relegated to traveling the stars via hyperlanes. 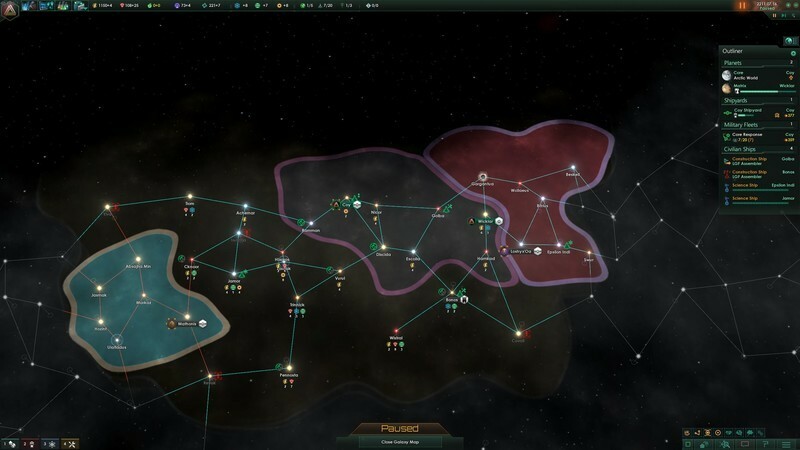 Before 2.0, people could choose warp travel, which completely nullified any defenses you had set up to guard your empire. All they had to do was merely skip across the map willy-nilly. Now, you can set up defensive bottlenecks, complete with some of the game’s new defensive options. You can still research warp travel later in the game, but it’s no longer available (thankfully!) right away. This ducktails perfectly into one of the game’s biggest (literally) new defensive options, the Ion Cannon. Ion Cannons are enormous weapons that can be built and attached to your space stations. Their mega-weapons can reach out and touch entire fleets from across whole systems, allowing you to weaken them before your own ships even close in to engage. 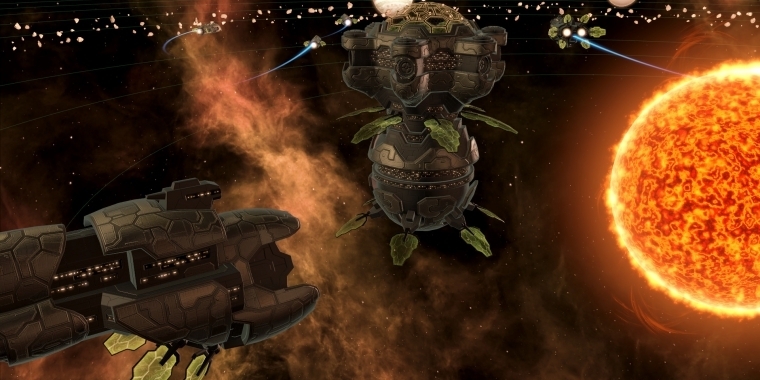 Another long-awaited defensive (or offensive for more aggressive empires) addition to Stellaris are the humongous Titan ships. These lumbering capital ships dwarf even your destroyers, and can confer tremendous bonuses onto fleets under their command. Or, they can administer de-buffs to enemy navies. Although Titans are bristling with turreted weaponry, they also possess the massive Perdition Beam weapon that can take out battleships in one shot. And perhaps the biggest draw of the Apocalypse DLC are the new Colossus platforms. Depending on what type of civilization you have developed, you can outfit your Colossi with different kinds of weapons. For instance, for all of you blood-thirsty, warmongering empire players, there are Planet Cracker beams you can outfit them with that can reduce entire worlds to stellar dust. Or, if you’re more of the non-violent, pacifistic type of civilization, you can shoot down an impenetrable force field that will encapsulate a world forever. In a rather fiendish twist, after kidnapping a planet like this, you can set up a research station to orbit it, and will receive a steady stream of resources. 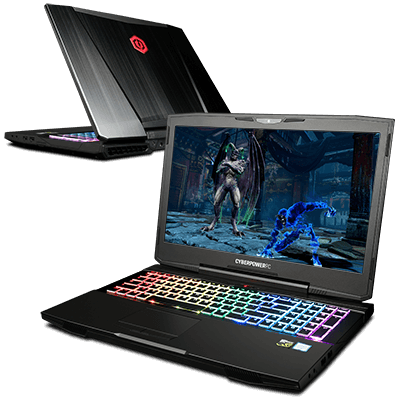 Both Apocalypse and the 2.0 update have really streamlined the combat systems and made them much more intuitive as well. Planetside garrisons actually have more of a purpose now, as do new buildings that can sway the course of battles in their favor. 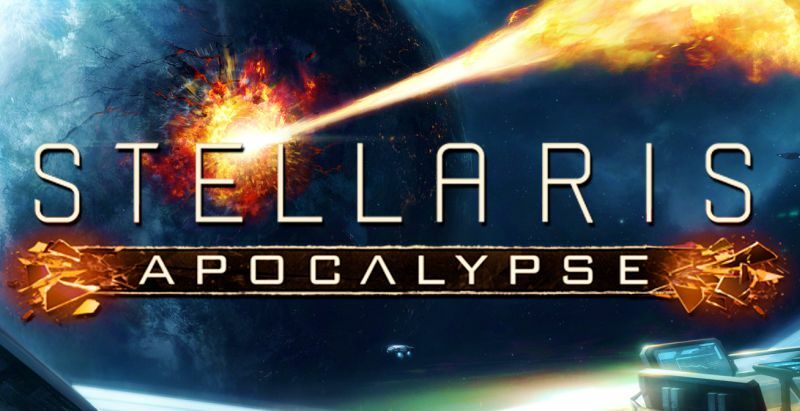 Overall, I found Apocalypse to be the DLC that Stellaris really needed in order to become the feature-complete space 4X strategy game that everyone knew it had the potential to be. It’s a brilliant addition to an already highly immersive game that should keep us armchair generals busy for quite some time.